The XFlow CFD solver is now available for use in the cloud. From the CAD world comes DEVELOP3D’s review of Solid Edge ST6. If you’ve ever wanted to write your own Tecplot file you need to learn about TecIO. Beta CAE released ANSA and μETA v14.2.0. 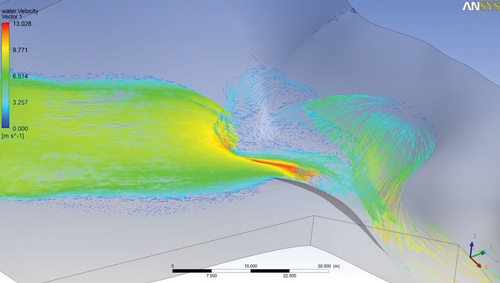 An ANSYS CFD simulation of flow over a waterfall on Vancouver Island. Image from R&D magazine. Convergent Science offers three tips on how to get consistent CFD results no matter who’s running the simulation. Automate. Take the person out of the loop and your consistency will improve. Best Practices. When you automate, you ought to be incorporating your organization’s best practices for applied CFD. Concise Deliverables. Make sure everyone’s trying to compute the same thing instead of one person going for surface pressure while another is hoping to get heat transfer. Ciespace will host a webinar, OpenFOAM for CFD, on 20 Aug 2013 to address why open source CFD may be better for you. The latest issue of the International Journal of CFD (Vol. 27, Issue 4-5) includes an article about GPU acceleration of Navier-Stokes solutions. COMSOL writes about how to perform a mesh refinement study. Monica Schnitger delves into ANSYS’ Q2 results during which the company had revenue of $215 million, up 10% from the same quarter last year. Learn about cavitation by firing an AK-47 underwater. Your entry for the Information is Beautiful Awards 2013 is due by 30 August. Since my high school days I’ve always had a hobbyist’s interest in physics. Obviously, it wasn’t my chosen career path but this article from MIT might explain why the two fields of study are more alike than different. Several years ago a fluid system was shown to reproduce the classic “double slit” experiment from physics. Now researchers from MIT have reproduced another phenomena from physics – the statistical behavior of electrons when confined in a circular region by ions. The experiment involves bouncing a droplet on the vibrating surface of a fluid and monitoring its path as it moves around the surface. The video at the link explains everything. I don’t know whether this result is startling or to be expected as a manifestation of particle-wave duality. 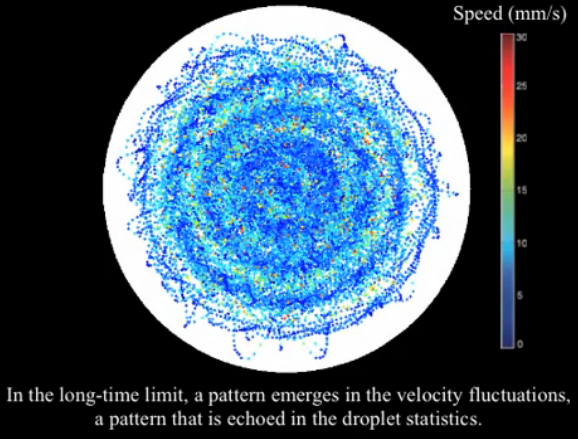 Screen capture from a video showing how a droplet bouncing on the vibrating surface of a fluid mimics the behavior of an electron. Video from MIT. This entry was posted in Applications, Events, News, Software and tagged ANSYS, Beta CAE, CFX, Ciespace, COMSOL, Convergent Science, OpenFOAM, Solid Edge, Tecplot, XFlow. Bookmark the permalink.